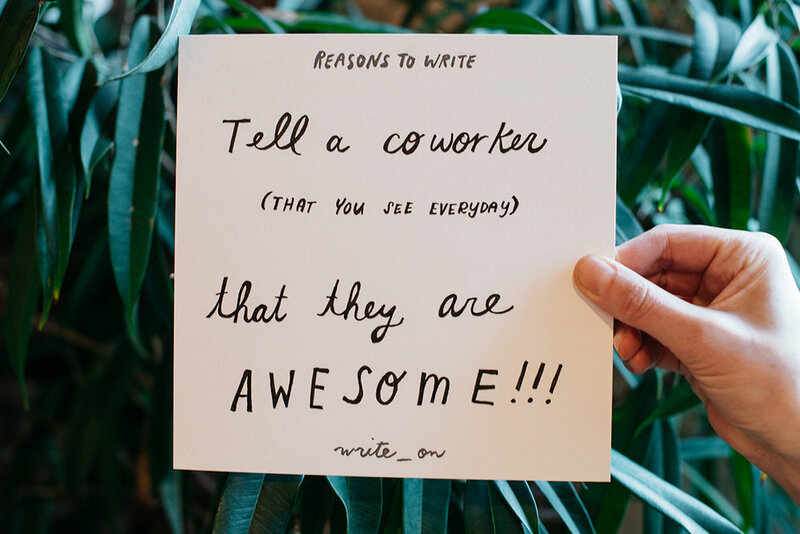 We've compiled our favorite Reasons to Write from past years below. + To send a friend a recipe for a great day. + To create an artifact and capture a moment in time. + To send a sketch of your garden. It will never look exactly the same again. + To write to a kid to teach them how fun it is to receive a letter. Ask for them to write back so that they can have fun sending one too. + To write a former teacher to let him or her know what you remember about their class and what you’re doing these days. + To decorate the envelope. 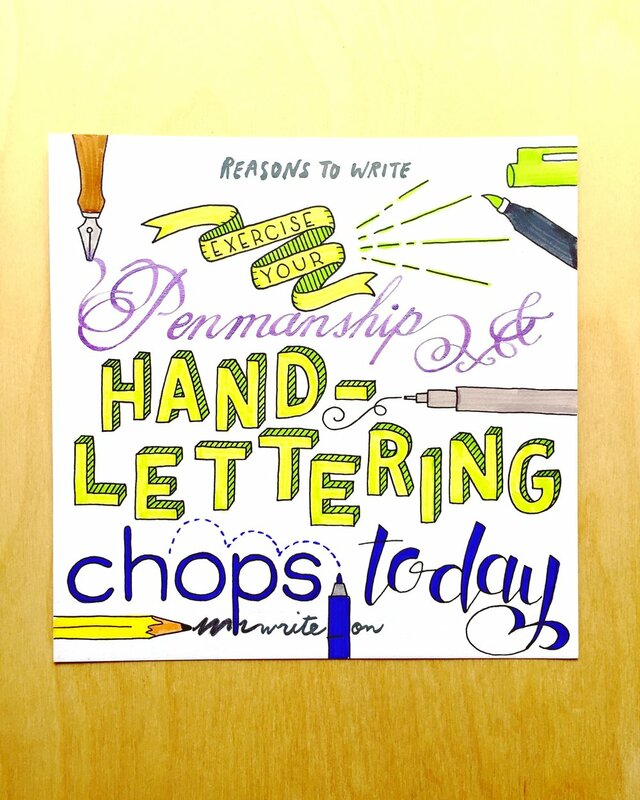 + To practice your penmanship, play with letterforms, and have fun expressing yourself on the page! + To send a letter with a fun activity in it (the crossword cut out? word search? A tic tac toe game with one square started?). 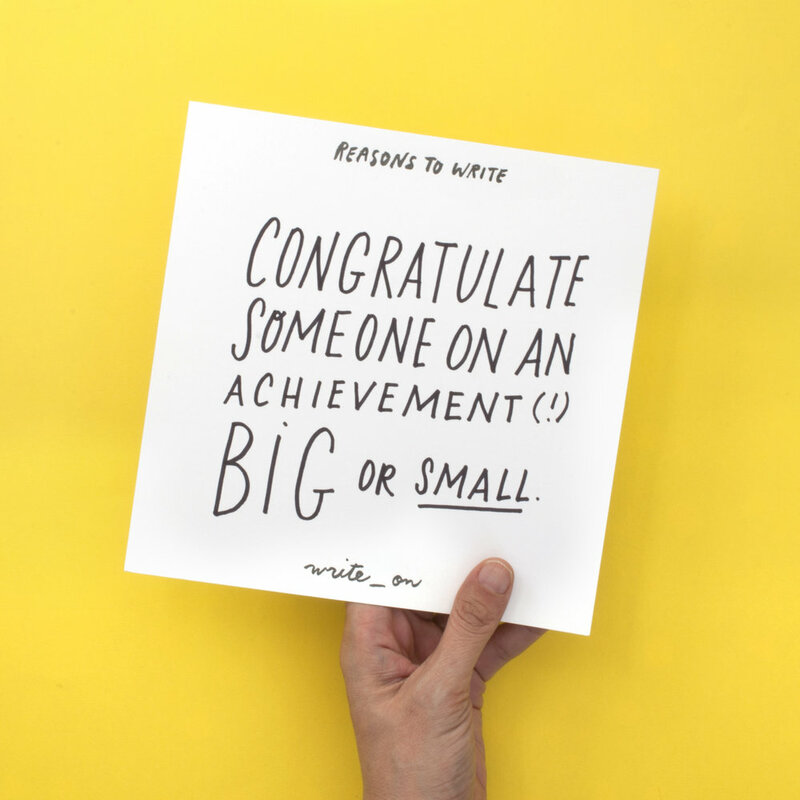 + To congratulate someone on an achievement big or small. + To send a friend a recommendation for a book that you read, really liked, and think they might too. + To say the things that are difficult to articulate in person. + To ask an older relative to record a memory. + To leave a legacy--make it really good and your letter may live longer than you. + To write a thank you to the barista who always makes your coffee just how you like it. + To write a haiku about the recipient. + To send your favorite recipe to a fellow cook. 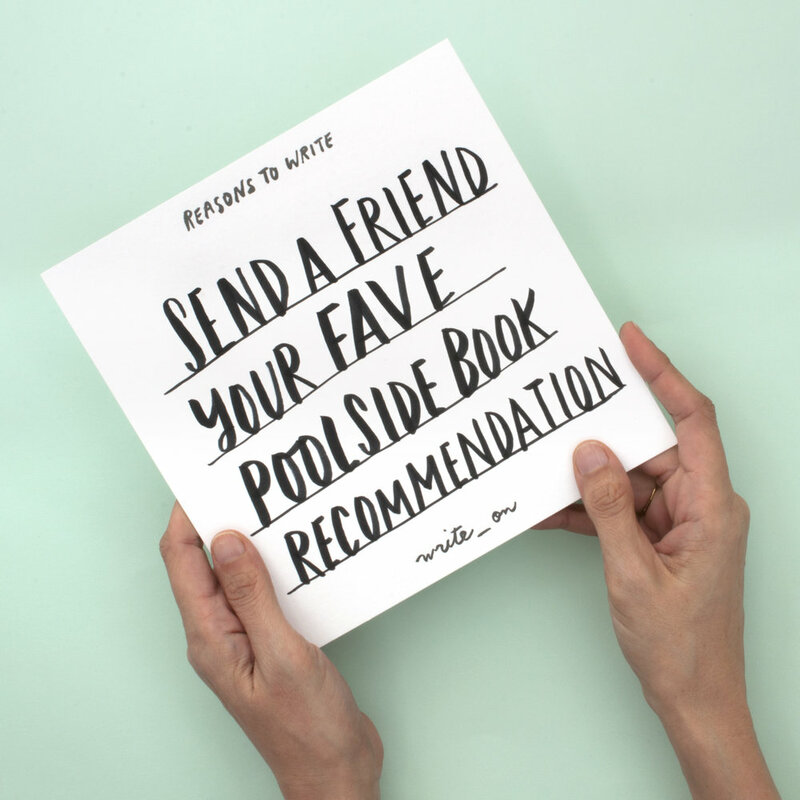 + To keep a travelogue on your next trip and send the entire thing to one lucky reader. + To send a letter from your pet to a friend’s pet. + To share a moment with someone you can't be with in person. + To send a letter in multiple parts - like a serial podcast or tv show where they have to wait for the next episode. + To send a self addressed stamped envelope with your letter so you get one back. + To send a handwritten “text" – a little note about your day, a one-liner, or a thought to a friend. + To try an experiment - to see what the US Postal system will deliver. A boomerang? A Potato? + To share a list of the best movies you’ve seen all year. + To write a casual invite. Please drop in for tea on Friday between 1-5! + To replace an old habit with a new one. 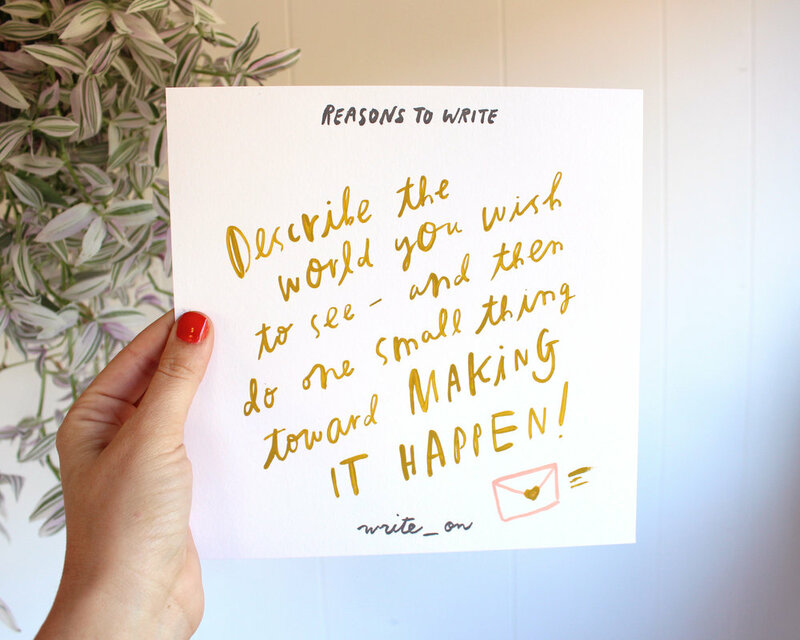 Every time you think of biting your nails (for example), write a letter instead! + To send a mini interview! Ask a friend basic things you don’t know about them or fun things you’ve been curious about. + To send a letter with a specific day of the week in mind – like a letter for a Monday where the envelope might say Open on a Monday only! + To send a note with an old photo you found – reminiscing about the time, place or funny fashion in those days. + To save the US Postal Service. + To send a re-thank you for a gift you received, have already thanked for but use so much you want to thank again. + To send a "thinking of you" note – example: listened to a podcast interviewing Mike Watt and was reminded of our college days. + To send a cheer up message– a note to a friend who has had a tough go of it lately. + To send a note to a business where you recently received great service. + To send a note to a child – they don't often get mail! + To send a note to an elderly person – related to you or not. 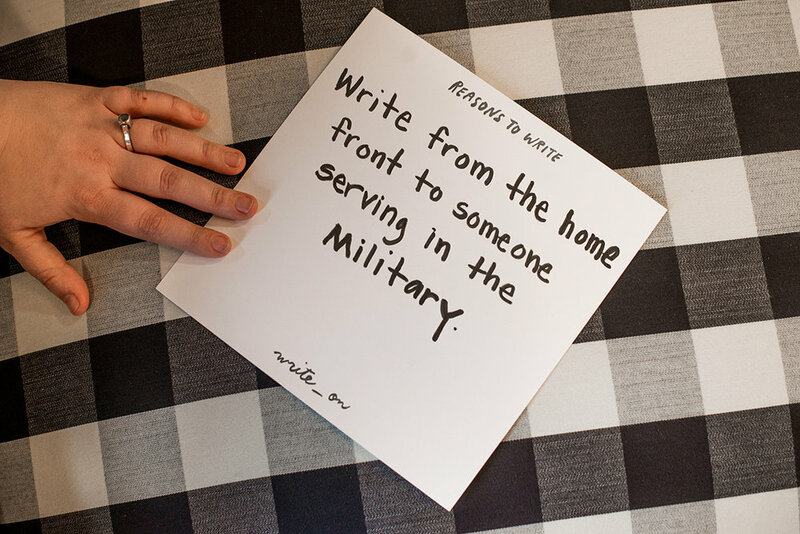 + To send a letter to your roommate, partner, or spouse – someone who lives in the same house as you. + To send a letter to a friend you haven't seen in a while. + To send a letter to a friend you just saw to tell them how nice it was to spend time with them. + To write a nice note to teachers of all kinds: your kids teachers, your yoga teacher, an old boss who taught you something. 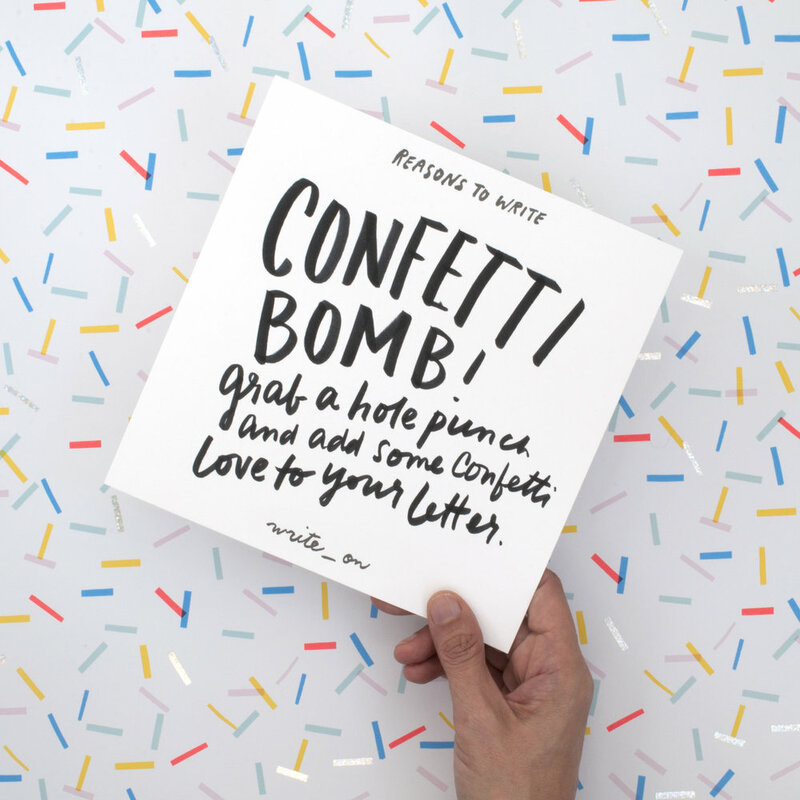 + To send a note to someone you think of often (and you don't know if they know that you do). + To write a note to someone you admire from afar. + To write a note to your doctor or acupuncturist to thank them. + To send a clipping from the paper, article or horoscope. + To write a note to the mail carrier. How many letters do they get? + To write to someone who has moved or just gone off to college. 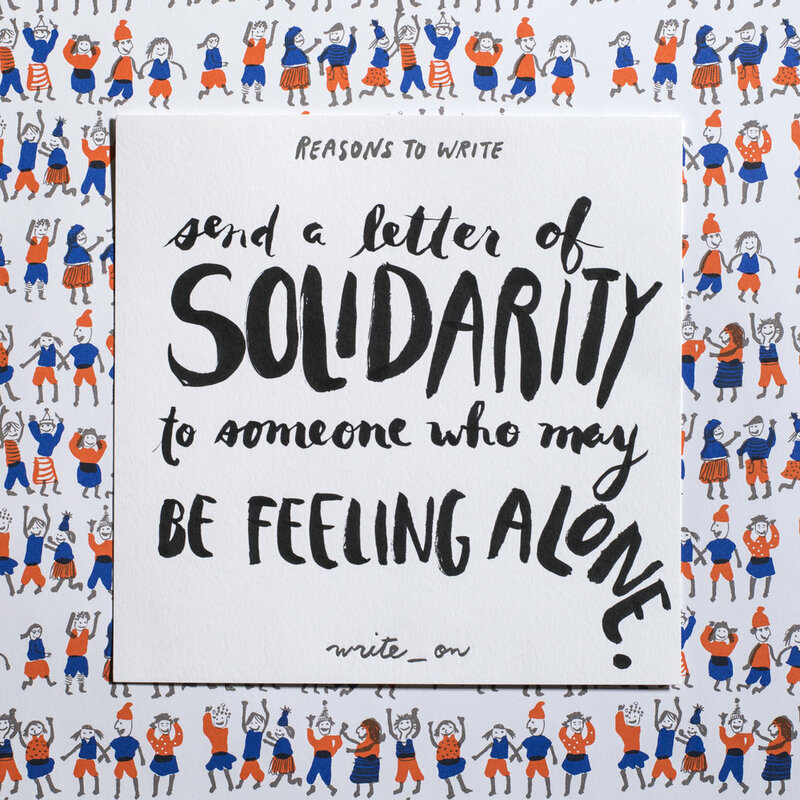 + To write someone in the hospital or who's dealing with an illness. + To send a belated thank you – it's never too late. + To mark obscure holidays that don't have cards. + To record a remembrance and share a memory. + To write a company who made a product you like. + To send a letter to someone in the military. 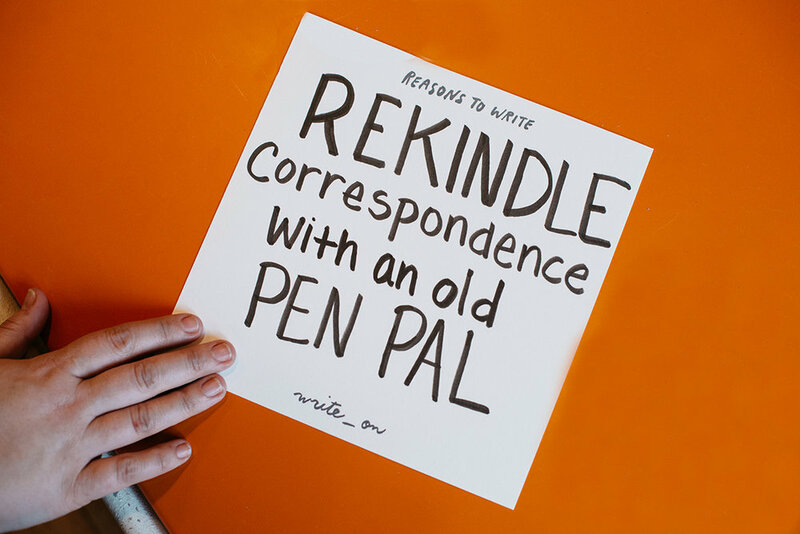 + To revive a correspondence with an old pen pal. + To write a letter to a foreign exchange student. 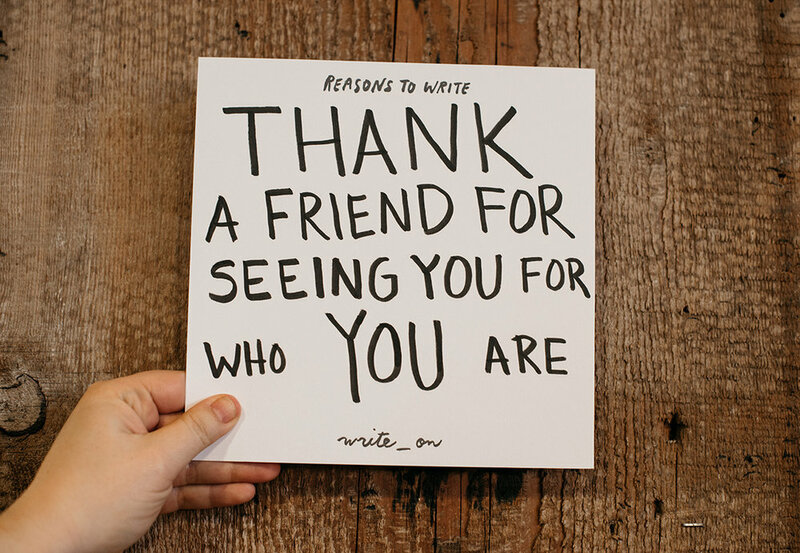 + To write someone who isn't on Facebook. + To write a letter to your future self. + To write a letter to a neighbor telling them how much you enjoy their tree, garden, house. + To write a letter to a housebound senior and offer to lend a hand. + To arrange a puppy play date. + To write a letter with checkbox questions that can be filled out and returned.